This entry was posted in 2012, Earth Changes, Earth Watch, Solar Event, Time - Event Acceleration, Unsolved Mystery. Bookmark the permalink. It only takes one good earth directed blast to cause havoc. 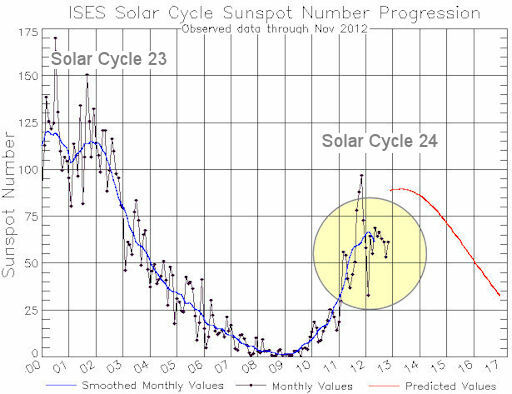 This past year, the majority of the big CME’s and solar wind blast have been non earth direction. We have been lucky so far. I think it may be time to let go of all the predictions and just put it in God’s hands and stop dwelling on what may or may not happen. If our hearts and minds are on him, that’s all that matters and whatever the earth or sun does or doesn’t do,utimately doesn’t change our future. Either in heaven or on earth. You are either living in God’s ways or walking in darkness and God is our light for this world and the next. Let’s just let all these predictions go!! Focus on GOD!!! “If then you have been raised with Christ, seek the things that are above, where Christ is, seated at the right hand of God. 2Set your minds on things that are above, not on things that are on earth. 3For you have died, and your life is hidden with Christ in God. 4When Christ who is your life appears, then you also will appear with Him in glory.” Letter to the Colossians from Paul. I’m with you Teresa! Let’s put all the signs and predictions on the trash heap of history and focus on what really matters, God and the Family of God … us. Amen and thankyou!!! I just got tired of all these predictions and worrying about them and my family etc… I am for my New Years resolution, not doing this anymore. None of them have come true anyway. God is the Ultimate decider and if He decides to destroy this earth , then I know in my heart I am ready to go with Him. That is all that matters!!!! Happy New Year Brother’s and Sister’s in Christ!!! More info on the subject. Couldn’t download this ‘collapsing atmosphere’ video on another site either. Thank you for posting such an informative video concerning the pole shift, the decreasing shield of protection covering Earth, the solar flares from the Sun and it’s affects on our Universe. I appreciate the narrative being neutral so the viewer is able to weigh the facts for themselves. Yep, the calm before the storm. Another website supposedly had a sunspot wink picture that the sun gave. You know, the kind of wink before someone pulls something big on you? That’s exactly what I’m wondering, Jade. First reactive “thought”, a “picture” of God raising His arm and hand in Heaven, the image my brain picked years ago to symbolize the Seventh Seal: “And there was silence in Heaven….” I know, or, at least, think I know, that we are lacking some “seals” before this actual event, but to my “heart”, this is spooky. Well, something is definitely unusual, so maybe it is 2013 and not 2012 (due to what’s happening in the Sun and, of course, the incoming comets in 2013), meaning that year zero (0) may not have been counted so the count is off by one (1) year!